Click on the coupons to access the catalog with printable coupons. From that page you can also download the app to use the coupons directly on your smartphone or purchase on the Toys R Us web site. If you register on the web site, you can get another coupon for 25% off your online purchase or 15% off your store purchase. Don’t forget there is free shipping with a 149 shekel or more purchase. 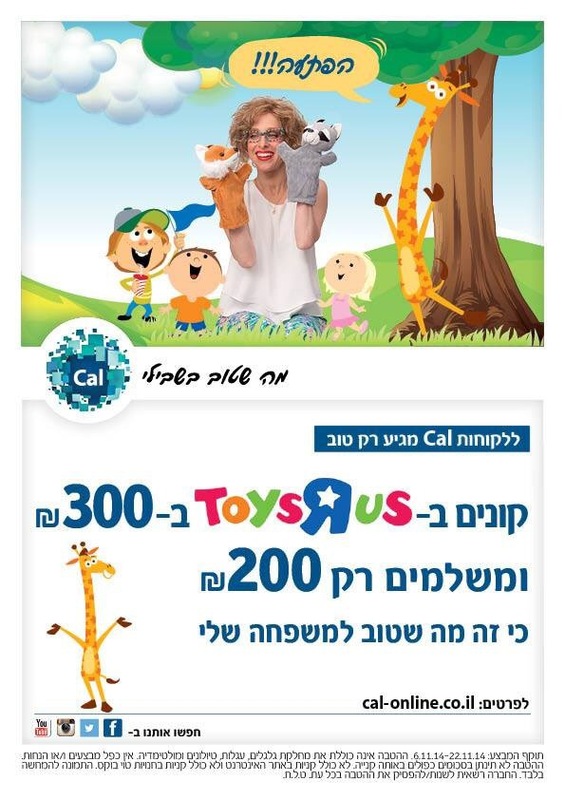 If you need to do some toy shopping (think Chanukah), take advantage of this deal- it expires 22 November 2014. It is almost warm enough to go to the beach, but your mind tells you you can’t- it is December. If you haven’t figured out what you are doing yet this week, here are some ideas. At the visitor’s center you can learn about the history of paper, paper recycling, see part of the manufacturing process, work with paper in a creative project and more. Activities are for families with children ages 6 and up (must show teudat zehut). Reservations must be made in advance. The tour is approximately 90 minutes. Cost- 20 shekels per person (discounts for groups of 20+ people). You will be asked to bring paper or carton for recycling. Open 9am-5pm Sunday-Thursday. Not a place but a web site with lots of coupons for all sorts of attractions. Don’t go anywhere without checking them out first. You don’t have to go to shop- go have a cheap tasty meal and enjoy the free kids activities listed below. Every day there is a free show and at 4:30 there is candle lighting and free sufganiot sponsored by Chabad. There are other activities as well- mechanical horses for 10 shekels, makeup, crafts and more. For more information click here for Hebrew (detailed) and here for English (abbreviated). If you are up near Beit Shean, stop at Kibbutz Sde Eliyahu for a tour of their organic agriculture and learn about their special techniques that make them world-renowned in the field. Tours on Chanukah run from 10:30am-1:30pm. There is a morning tour on Friday. You can add a tasting workshop to the tour as well for 25 shekels. For more information check out their web site. To schedule a tour call 04-6096986. If you are looking to get in touch with your inner hippie, go to HaYarkon Park this week. There will be lots of activities for kids and adults as well as places to put your tent if you wish to sleep over. For more information go to their Facebook page. Kenyon Ir Yamim in Netanya will be hosting free magic shows and workshops in magic throughout the week (Dec 2-4) from 11am-2pm and 3pm-6pm. The central magic show will be at 6:30pm. There is no charge. For more information click here. Kenyon Azrielli in Tel Aviv together with Microsoft is turning the mall into a giant XBOX. The games are out and free to use so have fun! Activities are from 11am-2pm and 4pm-7pm. This is a post from 2011, but I think it is still valid. Feel free to send in any relevant updates (prices, etc). In my last post listing the sales of the week, you might notice that NOBODY has sufganiot on sale. Why not? Because we are all so desperate to get our hands on that scrumptious ball of fried dough that we will pay any price to get it. Before you go and spend your hard-earned money in the bakery, read today’s ultimate frugal food shopper’s guide to sufganiot. The best thing about these sufganiot is their price- 5 sufganiot for 20 shekels. They are the same size as the other gourmet sufganiot. Although the kids liked them, the adults found them to be overly fried and the cream (katzefet) had a chemical taste. Kosher rabbanut. Conclusion- unless you are a health freak (and if you are, you shouldn’t be eating doughnuts), these are only a good option for the kids. English Cake sells three types of sufganiot- large sufgania (6 shekels), small sufgania (4.50 shekels), and “doughnut” (8 shekels), which is the hole-in-the-middle shaped doughnut. We got there just as the store opened and enjoyed a very soft, warm, traditional sufgania. The “doughnut” looked good, but was relatively pareve tasting. Kosher l’mehadrin. Conclusion- if you are a true Zionist, get your sufganiot here. This very famous bakery in Tel Aviv prices their sufganiot according to how they are cooked- baked doughnuts cost 7 shekels and fried sufganiot cost 6 shekels. If you buy 5 you get 1 free. The “coffee and ma’afah” also applies to sufganiot and costs 16 shekels. Their sufganiot are soft and filled with all sorts of dairy goodness. Kosher rabbanut. This Jerusalem-based chain is one of the few big ones that is Kosher l’mehadrin. Maybe it is me, but their chocolate looks very anemic to me. Their gourmet sufganiot are 7 shekels and their regular sufganiot are 4 shekels. This store has hands-down the best names for their sufganiot- names such as “Tutit” (Strawberry Shortcake) and “Yeladudes” (Kids), as well as the wackiest flavors- Bamba, marshmallow, and almond. The chocolate I thought anemic was not bad, but there was one major flaw in their gourmet sufganiot- NO FILLING! Conclusion- If you aren’t mehadrin, there are much better deals out there. These are Israel’s version of Dunkin Donuts. They come in pareve and dairy. Kosher rabbanut. We rated them very good (if you like Dunkin Donuts). Price- 3 for 20 shekels. They don’t have a store of their own, but you can find them in these stores. High class doughnuts, dairy and very rich. They come in flavors such as halva, belgian chocolate, pistachio, whipped cream, white chocolate with a berry chaser (a syringe filled with fruit syrup), and “Vodka Double Espresso”- chocolate with an espresso chaser. What we like the most about these sufganiot is that they are filled with lots of filling, which is not standard for Israeli sufganiot. Something I have never seen elsewhere in Israel is a list of how many calories each sufgania has, ranging from 170 (jelly) to 317 (chocolate ganache with a chaser). I am not sure if I like knowing how many calories are in my sufgania or not. After comparing, however, the amount of calories in Dunkin Donuts doughnuts (260-550 calories) or Krispy Kreme doughnuts (200-450 calories), I think Roladin has given me yet another reason to stay in Israel. Price: 8 shekels for the “standard” gourmet sufganiot, 9 for the chasers, 4.50 for traditional jelly and 5.50 for traditional ribat chalav (caramel). Kosher rabbanut. Conclusion- if you want to splurge, this is THE place to go. They are by far the best sufganiot on the market. Yes, you can compare doughnuts on Zap! On their web site, Shufersal Yashir’s’ sufganiot cost 4.99 each and Mega B’Internet sells them for 3.99. As you can see, they are the standard sufgania. You know what I am about to say, right? Make it yourself! This blog is by definition not a recipe site, but I welcome everyone to post their favorite sufganiot recipe. I personally have very little success with yeast recipes, so I use one with leben. And if anyone has a TNT method for getting that filling in without (a) destroying the doughnut (b) squirting it out the other side, or (c) having it shoot back in your face, I would be ecstatic to hear. Finally, these prices are based on the Modiin-Tel Aviv area. If the prices in your area are better or worse, let me know! If you found a great sufganiot bargain, please pass it on to the other readers! ISkate– located in Tel Aviv inside Luna Park. Open “every day of the year.” The hours on Chanukah (28 Nov-5 Dec) are 10:00-22:00. Leumi card and Isracard holders get a 1+1 discount. American Express card holders get a free ticket with 1200 points (not including Blue). Yes Planet in Rishon L’zion will be opening a ice skating rink especially for Chanukah is honor of the new Disney movie “Frozen” (לשבור את הקרח). Whoever buys a ticket to the movie or spends at least 25 shekels in the restaurant (kosher) can ice skate for free! Including skates! AchlaKerach– located in Maalot. Open every day of the week. Visa CAL card holders get a 1+1 discount. Ice Peaks– located in Holon. Open every day of the week. Visa CAL and Leumi card holders get a 1+1 discount and there any many more discounts available through different groups- click here for a full listing. Ice Peaks– located in Kenyon Lev, Ashdod. Also has discounts but recommends you check with your credit card/ group web site. Ice Mall– located in Eilat. Open every day of the week. For those who miss Vegas, this sounds like a good replacement. Some of the attractions in the mall include an ice train, a snow igloo, and Babylon games park, along with all the other clothing stores and restaurants. 50% discount for Eilat residents. Ice Space– located in Eilat. If you are looking for that frozen experience but do NOT want to ice skate, this is the place. It is a whole district made out of ice. There is sledding, sculpture exhibits and more. They provide the winter gear. Open every day of the week. Visa CAL and Isracard holders get a 1+1 discount. Each place has a different minimum age for entrance- check before going. None of these places allow pregnant women to skate. Prices are by the hour or half hour so check before you go.